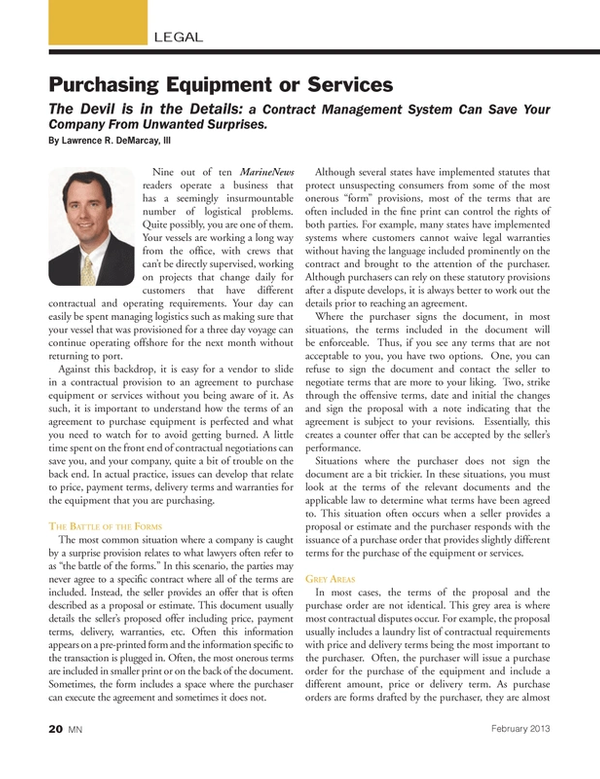 The Devil is in the Details: a Contract Management System Can Save Your Company From Unwanted Surprises. Nine out of ten MarineNews readers operate a business that has a seemingly insurmountable number of logistical problems. Quite possibly, you are one of them. Your vessels are working a long way from the office, with crews that can’t be directly supervised, working on projects that change daily for customers that have different contractual and operating requirements. Your day can easily be spent managing logistics such as making sure that your vessel that was provisioned for a three day voyage can continue operating offshore for the next month without returning to port. Against this backdrop, it is easy for a vendor to slide in a contractual provision to an agreement to purchase equipment or services without you being aware of it. As such, it is important to understand how the terms of an agreement to purchase equipment is perfected and what you need to watch for to avoid getting burned. A little time spent on the front end of contractual negotiations can save you, and your company, quite a bit of trouble on the back end. In actual practice, issues can develop that relate to price, payment terms, delivery terms and warranties for the equipment that you are purchasing. The most common situation where a company is caught by a surprise provision relates to what lawyers often refer to as “the battle of the forms.” In this scenario, the parties may never agree to a specific contract where all of the terms are included. Instead, the seller provides an offer that is often described as a proposal or estimate. This document usually details the seller’s proposed offer including price, payment terms, delivery, warranties, etc. Often this information appears on a pre-printed form and the information specific to the transaction is plugged in. Often, the most onerous terms are included in smaller print or on the back of the document. Sometimes, the form includes a space where the purchaser can execute the agreement and sometimes it does not. Although several states have implemented statutes that protect unsuspecting consumers from some of the most onerous “form” provisions, most of the terms that are often included in the fine print can control the rights of both parties. For example, many states have implemented systems where customers cannot waive legal warranties without having the language included prominently on the contract and brought to the attention of the purchaser. Although purchasers can rely on these statutory provisions after a dispute develops, it is always better to work out the details prior to reaching an agreement. Where the purchaser signs the document, in most situations, the terms included in the document will be enforceable. Thus, if you see any terms that are not acceptable to you, you have two options. One, you can refuse to sign the document and contact the seller to negotiate terms that are more to your liking. Two, strike through the offensive terms, date and initial the changes and sign the proposal with a note indicating that the agreement is subject to your revisions. Essentially, this creates a counter offer that can be accepted by the seller’s performance. Situations where the purchaser does not sign the document are a bit trickier. In these situations, you must look at the terms of the relevant documents and the applicable law to determine what terms have been agreed to. This situation often occurs when a seller provides a proposal or estimate and the purchaser responds with the issuance of a purchase order that provides slightly different terms for the purchase of the equipment or services. In most cases, the terms of the proposal and the purchase order are not identical. This grey area is where most contractual disputes occur. For example, the proposal usually includes a laundry list of contractual requirements with price and delivery terms being the most important to the purchaser. Often, the purchaser will issue a purchase order for the purchase of the equipment and include a different amount, price or delivery term. As purchase orders are forms drafted by the purchaser, they are almost always silent as to ancillary issues such as insurance, warranties, etc. In determining which terms were agreed to, a court will start by looking at the characteristics of the proposal. The initial offer, based upon its language, can be either revocable or irrevocable. Revocable offers do not contain a specific period for which they can be accepted and can be withdrawn by the seller at any time prior to the purchaser’s acceptance. On the other hand, irrevocable offers are open for a set period of time, such as thirty days, and can’t be revoked or modified by the seller during that period. This offer must be accepted during the acceptance period for the terms of the offer to be applicable. At the end of the term, the offer expires and the seller is under no obligation to provide the equipment or services on the terms included in the proposal. In the event that the purchaser responds to the offer during the acceptance period and provides slightly different terms, but does not address several others, the non-addressed terms will probably be included as part of the agreement. For example, if the proposal provides for two units of equipment, price, payment in thirty days and that purchaser is responsible for shipping costs but the purchase order provides for the purchase of three units of equipment at the agreed upon price and is silent as to all other terms. A court would likely find that the purchaser agreed to the other terms and only requested a modification of the agreement as to the number of units. Thus, the purchaser will probably be responsible for shipping costs and a payment term of thirty days as the terms were included in the original offer and not modified by the purchaser. Purchasers are often surprised by the inclusion of these terms. If the purchase order is not exchanged during the acceptance period, the terms of the original offer expire. Often, due to the delays inherent in the procurement process, the purchase order is transmitted after the acceptance period included in the offer expires. In this case, a court will consider the purchase order as a counter offer that was provided by the purchaser to the seller. If the seller agrees to provide the product pursuant to those terms, the terms included in the purchase order provide the full scope of the agreement. Using the example above, assuming that the purchase order was issued after the offer expired, the only applicable terms relate to the number of units and price. Terms such as warranties, shipping costs, etc. would be left to the various gap filling provisions outlined by the law. This scenario usually surprises the seller. The best way to avoid the issues related to this battle of the forms is to implement a system where each proposal is reviewed and the purchase process managed by one person who is trained to analyze these details. Once a proposal is provided, this employee should be tasked the assignment of looking the proposal over, including the fine print on the back page, and determining whether the terms are acceptable and what needs to be done to either accept or modify the terms. Once the terms are ironed out, the procurement process can be turned over to the accounting or purchasing department to complete the order / payment process once an agreement is reached.